One of my favourite things about making foods from other countries is that I can put it on our food menu on the fridge and no one really knows what we're having. I put poffertjes with ice cream as dessert and nobody could pronounce it and everyone was baffled as to what it might be. It can't be bad if it comes with ice cream! Anyway, poffertjes are little dutch pancakes usually made in a poffertjes pan. We don't have one of those so we'll be making ours in a frying pan and hoping for the best. Sift the flour into a stand mixer bowl and add the salt, sugar and baking powder. Using a whisk attachment mix in the milk, water and eggs until well combined. Heat up a non-stick frying pan and spray with a little oil. Use a spoon to make tiny pancakes. As small as you have patience for. When they are cooked on one side, flip over and cook for another minute or so. Serve with syrup, icing sugar and vanilla ice cream. We all loved them! They're slightly different from regular pancakes, thicker and spongey in texture. I tried to keep them tiny but as you can tell from the pictures they got a bit bigger everytime. I think they still count as bite-size if you can fit a whole one in your mouth at once. Perfect for Pancake Day coming up or as a dessert on any day. Yum! 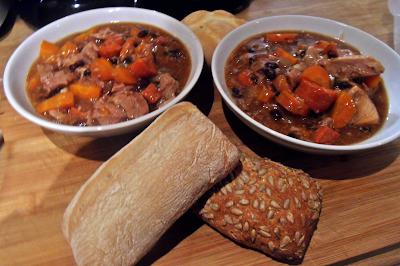 This stew seems perfect for a cold Saturday night in January! It has a lot of our favourite ingredients and looks nice and hearty. Place the pork in the bottom of your slow cooker. No need to chop it now as it'll easily break up once it's cooked. Chop the chorizo, onions and carrots then throw them in too. Add the black beans, vinegar and chilli flakes. Stir it up well and pour over boiling water until everything is just covered. Cook on High for 2-3 hours then on Low for another 2 hours. Leave off the lid and turn off the slow cooker for 30-40 minutes so it'll cool and thicken up. Serve with rice or some nice bread rolls.